From the view lots you have a spectacular view of majestic Mt. 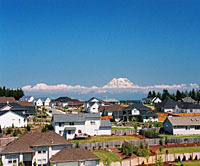 Rainier, the panoramic Olympic Mountain Range and the Black Hills to the west. You and your family will enjoy the fabulous sunrises and sunsets. 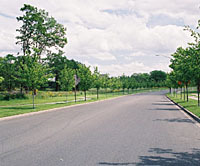 Each building site is anywhere from 1/3 to 1 acre in size with all underground utilities and family friendly streets with sidewalks and streetlights which encourage neighborly strolls. Protective covenants insure a continued quality of life and a consistent increase in property value. Thurston County is located in the southern part of western Washington at the terminus of Puget Sound. It is the 32nd largest county in the state, with a total land mass of 737 square miles. As of 1995, nearly 93% of the land area was unincorporated. The area topography ranges from coastal lowlands to prairie flatlands to the foothills of the Cascades. Glacial activity in the County’s geologic past left the land dotted with lakes and ponds. A number of rivers and small tributaries end in Thurston County and drain into Puget Sound. The northern-most boundary of the County is determined by the shoreline of Puget Sound. Inlets exclusive to the County are the Budd, Henderson and Eld Inlets. Budd and Henderson Inlets are separated by Dana Passage. Other inlets form boundaries between Thurston and adjacent counties. Totten Inlet divides Thurston and Mason Counties, and the Nisqually River separates Thurston from Pierce County. As of the year 2000, the population of Thurston County was 207,355 which shows an average annual rate of change of 2.5% since 1990. County total population projections show that by the year 2005, the figure will be 236,420. There are 8 school districts providing primary and secondary education to most of Thurston County’s students. A full 75% of public school attendance is in three of the North County School districts. North Thurston serves 34% of the students; Olympia serves 24%; and Tumwater serves 17% of the County students. There are 13 secondary schools, one institutional school (Maple Lane), and one vocational school (New Market Skills Center) are also located in the County. Precipitation 7.98 in. 3.35 in. .76 in. 4.72 in.